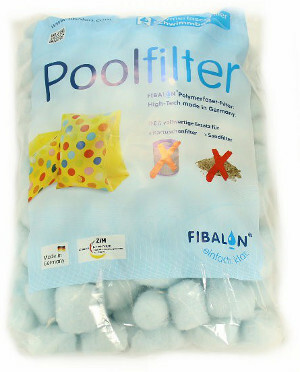 "One 350g bag is equivalent to 25kg of filter sand"
Fibalon can be used in conventional filters in place of sand or glass media, and it can also be used in cartridge filters. This means Fibalon is hugely adaptable, there is no need to buy specific costly cartridges for your Pool, Spa or Hot Tub, just use Fibalon! Fibalon is fantastic at removing small particles from water without clogging, making it an ideal product for us in Aquariums and Ponds. Unlike sand which will clog very quickly, Fibalon continues to filter with low resistance levels of 20 Mbar - compared with 200 Mbar for sand. Fibalon is currently approved for use with liquids, oils and air. Its uses range from fine dust particle filtration from air flow, to oil separation and liquid pre-filtration. It is insensitive to light, cold and climatic changes, it�s dimensionally stable. Fibalon is resistant against acids, salts, alcohols and oil - it�s also useable with biocides, usable with stabilisers, useable with hardening agents and softeners, and also useable with anti-corrosion agents. Owing to this versatility, the uses for Fibalon are almost limitless. One 350g bag is equivalent to 25kg of filter sand.